The Malaga Brace (figure 3.8) is basically a custom made TLSO, and is commonly prescribed in Southern Spain, however it is relatively unknown outside of Spain (most commonly known as "el corse de Malaga"). It is a corrective spinal orthosis used in the treatment of coronal plane curves, but it does not have a derotation element incorporated in the brace. The brace is of monovalve construction with a posterior opening that closes with metal fasteners. The patient wears the brace during the night and day, 23 hours per day (Wood, 2003). 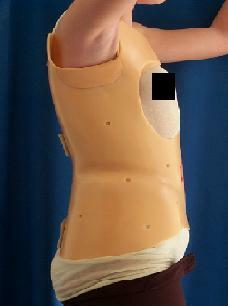 Anterior superior shape: the brace reaches to the superior sternum border and subclavicular laterally, so that it can prevent antepulsion of the shoulder. Posterior superior shape: extends up until it totally covers the scapulas. Anterior inferior shape: extends to the symphysis pubis and curves upward at the thighs to permit sitting without discomfort. Posterior inferior shape: follows a horizontal line from the symphysis pubis and is above the greater trochanter. The anterior portion of the brace consists of a large open space that leaves room for the breasts so they are free from impinging by the brace, therefore growth is permitted without causing discomfort. The anterior inferior portion of the brace has abdominal pressure build into the brace, of which extends up to the xiphoid process. The abdominal pressure helps maintain the correction of lumbar hyperlordosis. The brace could have holes pierced in the plastic therefore provides a reduction of sweating and facilitates ventilation. The posterior fasteners must be protected to avoid damage to the clothes. A chin piece superstructure could be utilised in curves with the apex higher than T5-T6. The pressure pads are thoracic, lumbar or both, the number and location of these depending on the type of curve presented. The pressure pads normal ranges are from a 5mm to 10mm thickness and are fabricated in Pelite. A copper wire is placed on the inside of the pad in the form of cross at the apex of the curve or around the entire external edge of the pad, this allows correct pad placement to be identified on the X-ray. 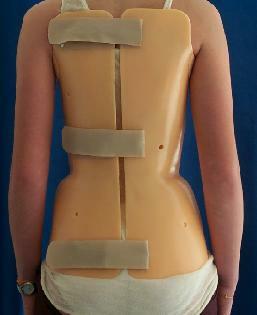 The thoracic pad has an oblique arrangement following the direction of the ribs, with a greater thickness at the spinous processes. The vertical length extends along the entire distance of the curve and horizontally expands to 2-3cm medial to the midline of the axilla. The thickness of the pad depends on the amount of rotation presented. The lumbar pad is also fabricated in pelite and is pisiform shaped. It has a derotating action that is applied over the lumbar transversal processes of the convex side of the curve, also, the lumbar pad acts to reduce the lumbar curve in the coronal plane (Hidalgo, 1993). 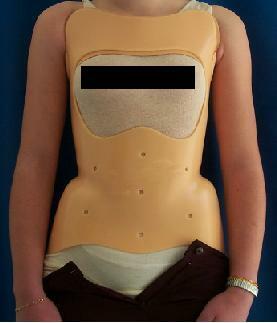 Figure 3.8 a) Anterior view of the Malaga brace with a large anterior opening that provides space for the breasts of the patient. B) Posterior view of the Malaga brace with a posterior opening for donning and doffing of the brace. Three metal fasteners secure the brace on the patient. This Malaga brace was designed, hand modified and delivered to the patient by Grant Wood in Malaga, Spain, 2001, Grupo IDEO (ITECO).